Saturday morning we managed to wake up before sunrise, which is a rare feat for us. We start most Saturdays with some kind of breakfast out, but since I'm usually anxious to get on the birds as fast as we can, the quality of the meal goes downhill when we get a later start. When we make it out of the house before 8am, we relax with a sit down meal somewhere like The Egg & I, or Village Inn. If it's more like 9 or 10am when we get going, we usually do something quicker like Big City Burrito (I highly recommend Jerry's Flamethrower, a very tasty breakfast burrito). Anything after that and we'll probably either hit up a drive-thru or just skip breakfast. First prize (left), second prize (middle), and third prize (right) for waking up in the morning. 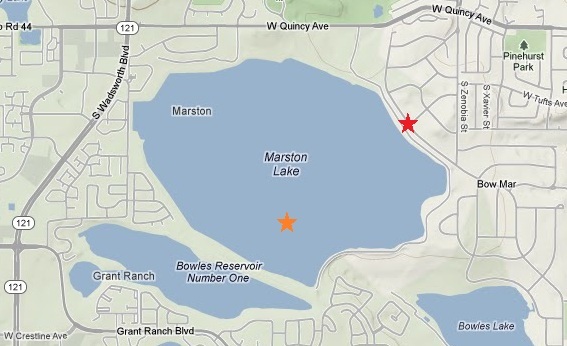 First stop of the morning was Marston Lake in Denver County. Having grown up in rural Idaho, I've never grown accustomed to the heavy traffic that usually surrounds most of the Denver area, and my patience for tailgaters is even lower when I'm hoping to be able to stop to look at birds. As a result, we focus most of our birding efforts this time of year on the rural areas of several counties north of Denver. However, the hope of seeing a long-staying White-winged Scoter was enough to get me to drive across town this weekend. 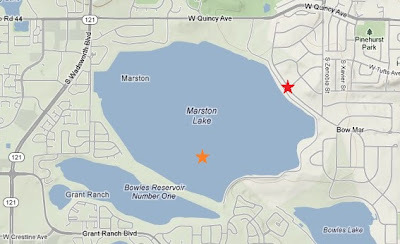 Our home indicated by the red star, Marston Lake indicated by the orange star. 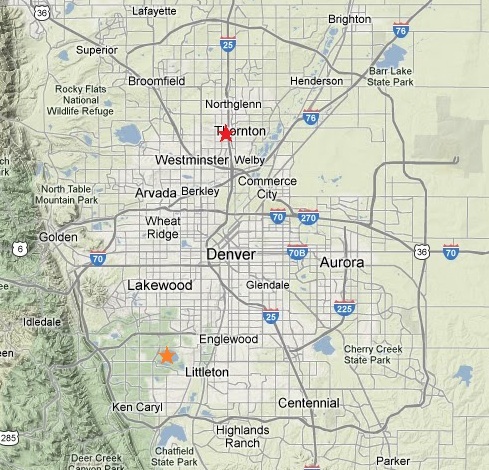 Marston Lake is located south-southwest of Denver, west of the beautiful Bow Mar neighborhood. Getting a good view is not easy. The best views might be along the northeast edge on Bow Mar Drive, where you can pull your car off the road (I think? I didn't see any "No Parking" signs) and scan from the road. Bow Mar Drive indicated by the red star, the location of the White-winged Scoter indicated by the orange star. Even here, the view is broken by a tall fence that surrounds the reservoir. 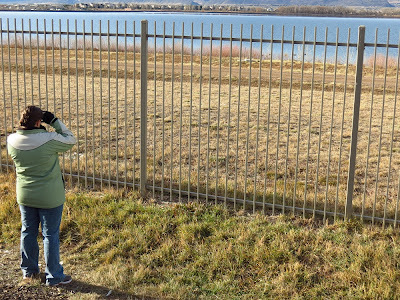 We set up our Canon SX40 HS on the tripod right up against the fence and started scanning the lake. Unfortunately, I'd left the quickplate for our better tripod and scope at home, so we had to rely on our binoculars and camera for identification. Ellen, enjoying the best vantage point we could find. Marston Lake, Denver County. December 1, 2012. We undoubtedly missed a number of birds that were on the lake (later confirmed as other's eBird reports from around the same time started coming in showing species we had not seen), but after about 20 minutes of careful scanning, we managed to find our White-winged Scoter! This was lifer #298, and a great bird to have on our 1,000th eBird checklist. 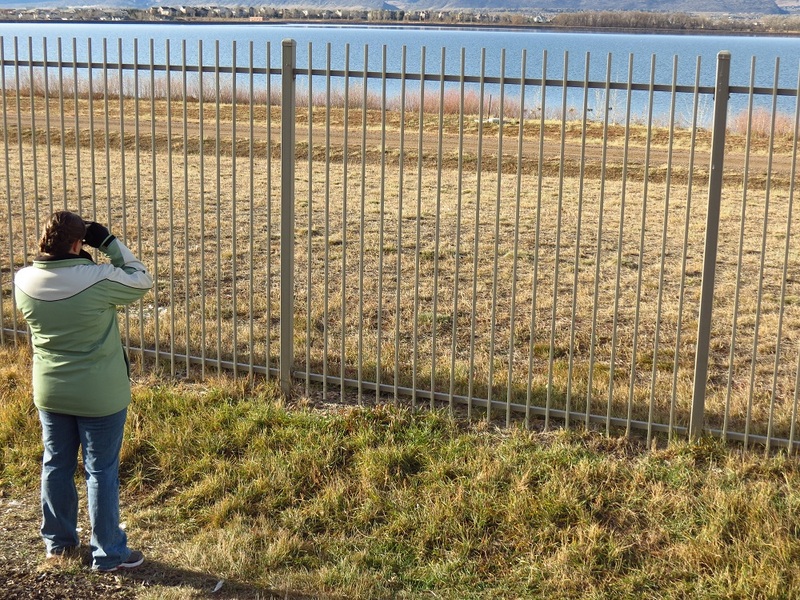 We're grateful to have binoculars with some serious light-gathering power, and good eyesight, as Google Maps tells me the bird was about 2/3 of a mile away across the reservoir. 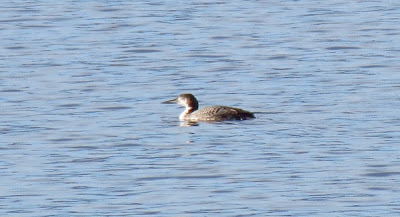 At that distance, we were not able to get any decent documentation shots with our camera, though we did get good looks at an immature Common Loon that was a little closer. 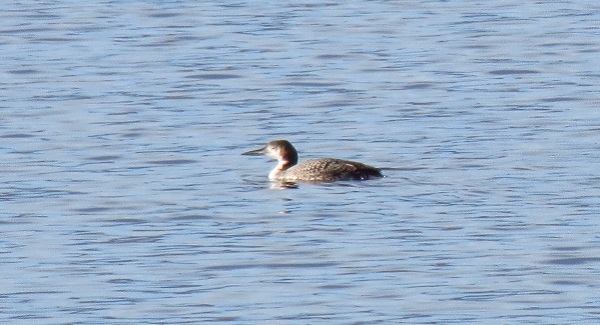 Common Loon (immature). Marston Lake, Denver County. December 1, 2012. Others had reported seeing a Pacific Loon a few days earlier, and a Surf Scoter later the same day, so if either of those are still showing up through this next week we may make a return trip. After Marston, we headed up to Boulder to make our second attempt at the Northern Cardinal that's been hanging around Dakota Ridge Trail for the past two weeks. It was a beautiful, bright, sunny day, which we were hoping would make for great photo opportunities for this magnificent bird. 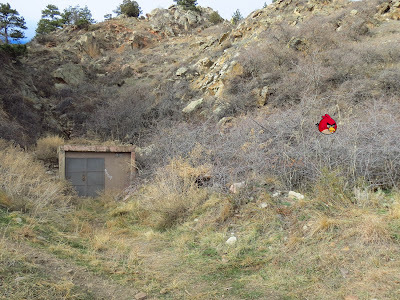 We headed up the trail towards the cement pump house where the bird has been seen most frequently. 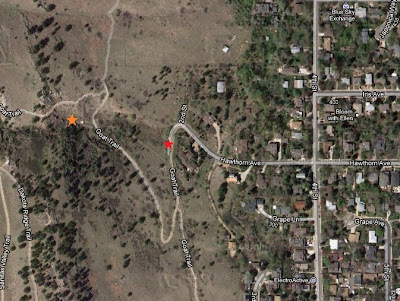 reported location of the Northern Cardinal indicated by the orange star. Though we hung out for close to two hours, the bird did not make an appearance for us on this trip. This was one of those frustrating experiences where you know you're at the right place at the right time, you're being patient, conditions are wonderful, and you feel like you're doing everything right, so you deserve to see this bird! Too bad for us that the birds are not sympathetic to our desires. Even more frustrating was finding out that just a short while after we finally decided to move on, another birder reported finding the Cardinal right where we'd been! of Northern Cardinal indicated by Angry Bird. December 1, 2012. There was a pretty good variety of other species typical of the foothills environment this time of the year. 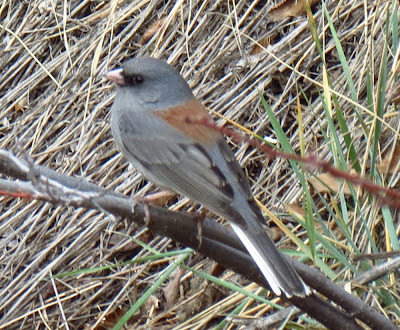 Highlights include a number of Dark-eyed Juncos (a good mix of races, though mostly gray-headed), Townsend's Solitaires, Western Scrub-jays, Stellar's Jays, Northern Flickers, a Downy Woodpecker, a Spotted Towhee, and a Sharp-shinned Hawk. 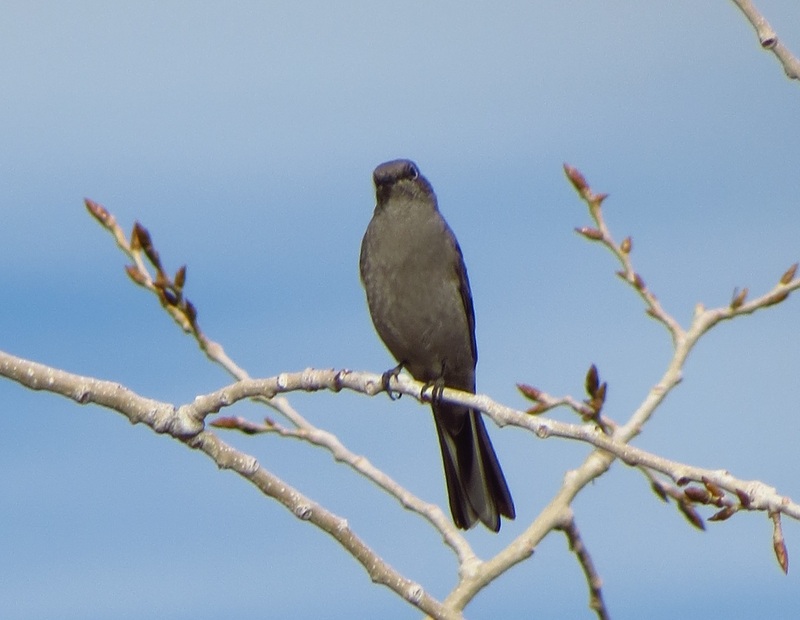 Townsend's Solitaire, perhaps wondering what we're staring at. 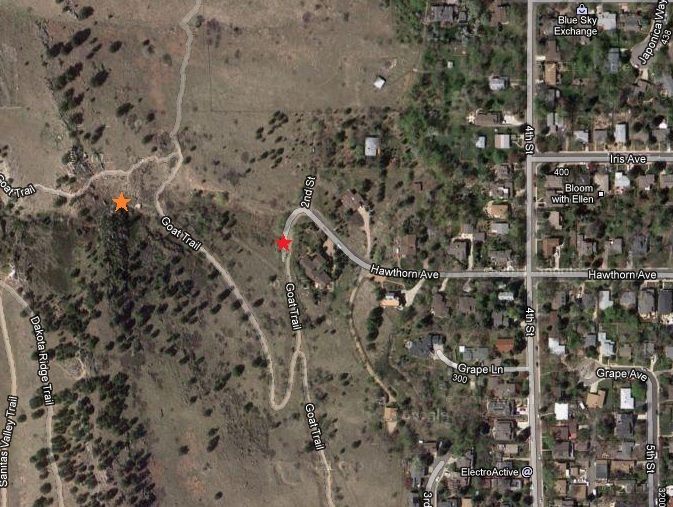 Dakota Ridge Trail, Boulder County. December 1, 2012. We didn't see anything rare, but I always get a lot of pleasure out of seeing birds exactly where they're supposed to be. There's just something wonderful about being able to learn something in a book, and then look out at the world and verify it through your own observation. 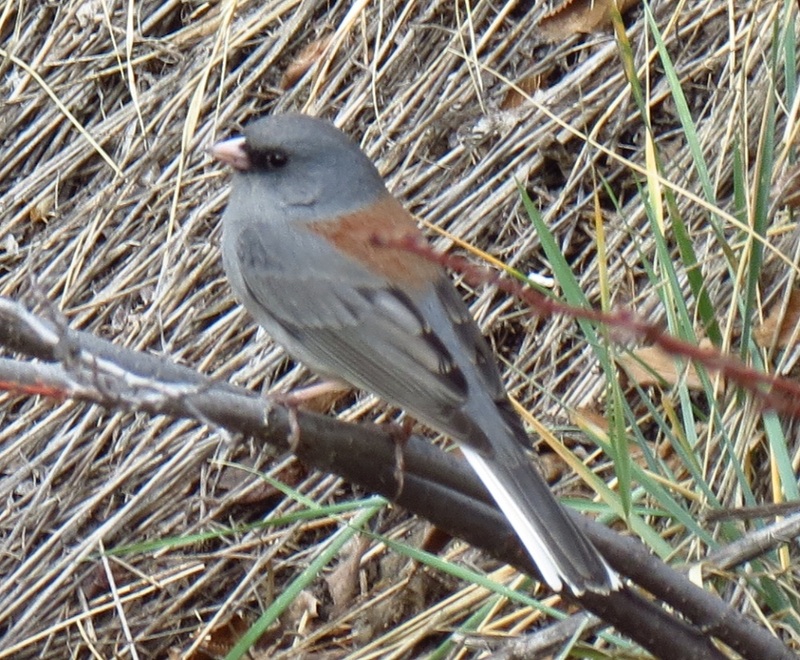 Dark-eyed Junco (gray-headed). Dakota Ridge Trail, Boulder County. December 1, 2012. 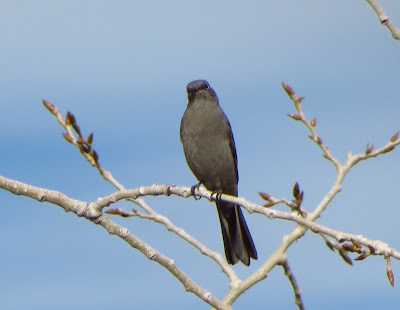 Next we headed over to Boulder Creek at 75th Ave to try for the Winter Wrens and Rusty Blackbird that have been seen there. This location is just north of Walden & Sawhill Ponds, which we bird at quite regularly, so we were kicking ourselves for never stopping to bird along the creek until this weekend. 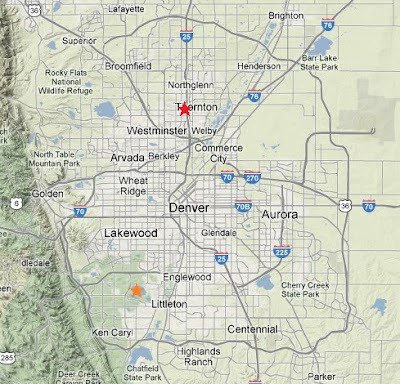 reported location of the Winter Wrens indicated by the orange star. It seemed like everybody around wanted to try for the Winter Wrens and Rusty Blackbird, as we ran into other birders every few minutes for the entire two hours we were there. Nobody we spoke to had seen the birds that day, and neither did we. 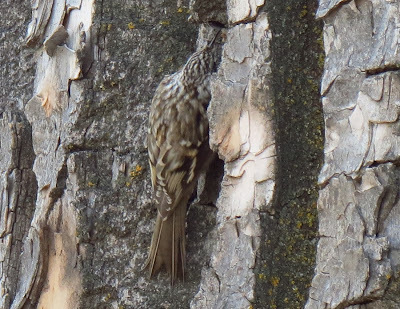 Brown Creeper showing off its cryptic plumage. Boulder Creek at 75th Ave, Boulder County. December 1, 2012. One reason I like chasing rare birds (even when I don't find them) is that it encourages me to be more thorough. When the bird you're after is nothing more than a third of an ounce of brown fluff, you have to slow down and really focus on everything you see. Every time we chase a rare bird, the added intensity we apply to our birding results in learning something new and wonderful about our more common birds. 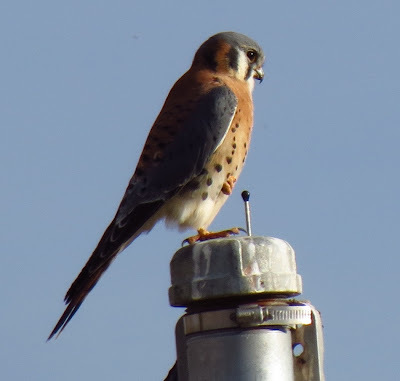 American Kestrel. Boulder Creek at 75th, Boulder County. December 1, 2012. 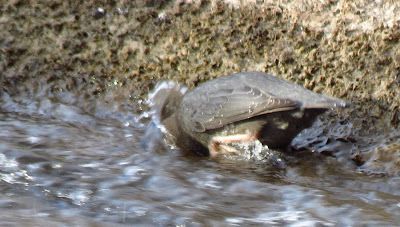 Perhaps our best find was an unexpected (though not entirely uncommon) American Dipper feeding in the tumbling water underneath the 75th Ave bridge. We walked right past the bird once without even noticing it. It was only on our return trip under the bridge that we spotted the Dipper no more than 20-25 feet away. American Dipper. Boulder Creek at 75th, Boulder County. December 1, 2012.
preening, since it takes a lot of work to stay water-proofed well enough for life as an aquatic passerine. 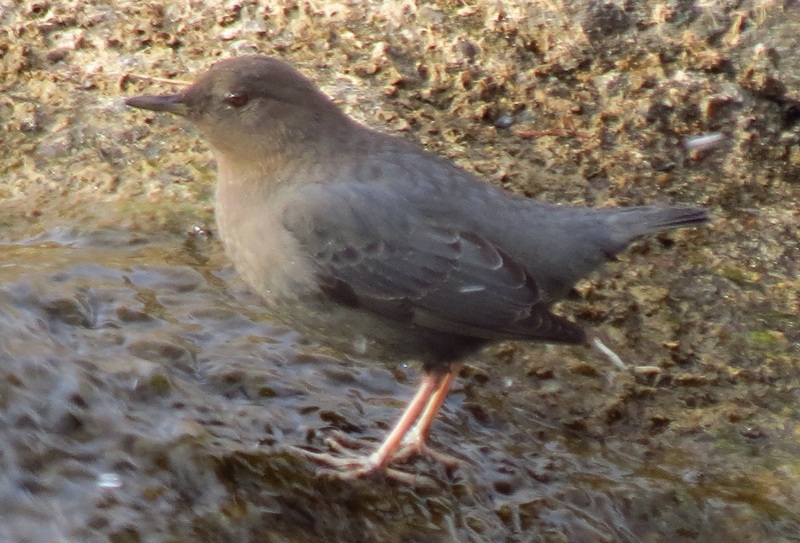 American Dipper, perhaps testing a new cure for hangovers. Boulder Creek at 75th, Boulder County. December 1, 2012. All in all, we had one eBird goal, and four target species for this weekend. We managed to hit our eBird milestone of 1,000 checklists with the first stop of the day, which also included the only target bird we successfully found (White-winged Scoter). Let's hope the others stay put long enough for us to try again next weekend!